Day in and out I take comfort in the white noise of manufacturing; a forklift reverse alarm and trucks driving by our building are not a nuisance, but rather the bustling noise of life in my cubicle. It’s hard to believe that everything we touch and see throughout our day have all been built here, on our Pale Blue Dot — that is, until recently. As additive manufacturing and rapid prototyping here on Earth have taken off with the commercialization of 3D Printing, one new space venture looked up. Made in Space is a five year old company based in Moffett Field, California who has successfully sent and tested a 3D printer on the International Space Station (ISS). 3D printing is like printing a brochure or email. But instead of using ink to print on a flat piece of paper, a 3D printer uses plastic “ink” to build up a three dimensional shape. Like the stacking of Legos, a 3D printer lays down semi-solid plastic filament in a pattern designed in any CAD-like software. Printing can take anywhere from a few minutes to a few hours depending on the size of the unit, the density of the filament, and the speed of the mechanical motors that guide the printing nozzle. The most basic of 3D printing machines can cost as low as a thousand US dollars. The 3D printer in space is discovering how microgravity affects the printing process. The printer was redesigned from the ground up for the ISS to address gravity and cleanliness challenges. The printer departed for the space station in September 2014 aboard SpaceX’s CRS-4 mission. Eight months and 21 printed objects later, the printed tools were sent back to Earth via SpaceX CRS-5. The return payload arrived at NASA Marshall in April 2015 where the study of the tools and testing began. Keep up with the project on NASA’s 3D Printing In Zero-G website. Its implications are much greater than just a cool gadget in space. The days of quick-fixes with Apollo 13’s duct tape and ISS’s spare toothbrushes could end in future endeavors where “fablabs” may be the norm. The vision behind this technology demonstration is to reduce the amount of tools and spare parts needed during spaceflight. 3D printing not only reduces shipping weight but makes more room for scientific payloads and food. Furthermore, reducing the dependance on Earth makes missions to other planets more attainable. What’s next for Made in Space? They are working with NASA Marshall to debug their printing test bed; the AMF or Additive Manufacturing Facility is a fablab that the company is hoping to deploy using the lessons learned from the Zero-G printer. They are also in the process of designing a recycler, the R3DO that could recycle and reuse printed or leftover filament. This could greatly reduce waste from the process while increasing time between resupply missions. In other news, ULA’s new Vulcan rocket is expected to save over $1 million US dollars through 3D printing of polymer and metal parts. They are considering 150 different parts to be printed. 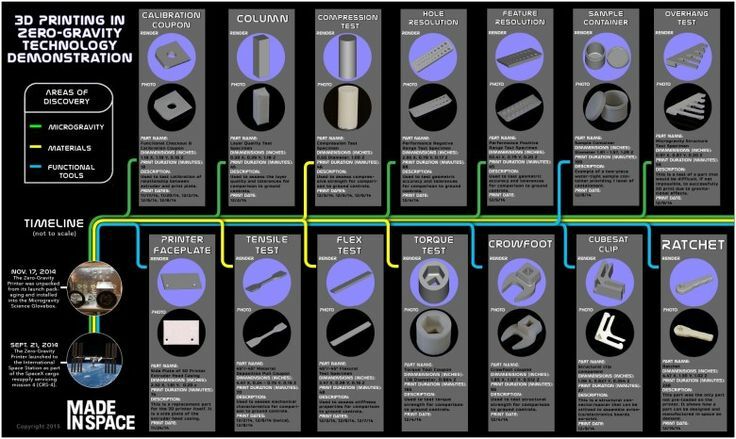 This is just another way additive manufacturing is redesigning the space industry.